An early William Faulkner play entitled “Twixt Cup and Lip,” written when the great American novelist was in his early twenties, has been published for the first time in the new issue of The Strand Magazine. The one-act play demonstrates a different side to the typically intense and brooding writer. Light and comedic in tone, “Twixt Cup and Lip” sees two thirty-year-old bachelors vying for the affections of a nineteen-year-old girl. The play was discovered by Andrew Gulli, managing editor of The Strand, in the Albert and Shirley Small Special Collections at the University of Virginia in Charlottesville. Gulli also discovered and published a lost F. Scott Fitzgerald story in The Strand earlier this year. “I was surprised to find it and I thought it was a fine gem by a young Faulkner who would go on to write works that were dark masterpieces and also some wonderful screenplays,” said Gulli in an interview with The Guardian. “Twixt Cup and Lip” was written while Faulkner was a member of a University of Mississippi theater troupe in the early 1920s. Faulkner would go on to publish As I Lay Dying in 1929, setting the foundation for his prominent literary career. 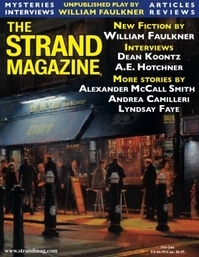 An early William Faulkner play entitled "Twixt Cup and Lip," written when the great American novelist was in his early twenties, has been published for the first time in the new issue of The Strand Magazine. The one-act play demonstrates a different side to the typically intense and brooding writer. Light and comedic in tone, "Twixt Cup and Lip" sees two thirty-year-old bachelors vying for the affections of a nineteen-year-old girl. "I was surprised to find it and I thought it was a fine gem by a young Faulkner who would go on to write works that were dark masterpieces and also some wonderful screenplays," said Gulli in an interview with The Guardian. "Twixt Cup and Lip" was written while Faulkner was a member of a University of Mississippi theater troupe in the early 1920s. Faulkner would go on to publish As I Lay Dying in 1929, setting the foundation for his prominent literary career.